You see this message because Windows Live products are not supported on these version of Windows (but will work anyway). 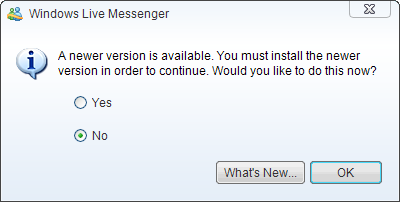 This sort of thing isn’t new, Messenger has been blocked from installing on some Windows versions before. There are two solutions you can take to solve this problem, depending on your preference. You can force your current version to keep working, or you can force the latest version to install. The choice is up to you. 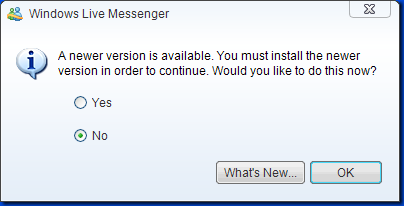 You can continue to use your current version of Messenger by setting it into Windows XP compatibility mode (yes, even on XP 64-bit). Since the instructions, paths, and shortcuts will change depending on which Messenger and Windows version you’re using, I’ve created a quick application you can run to make the necessary changes. You can now sign in as per normal. You will not need to run the msngrcompat.exe again. After this you’ll find Windows Live Messenger on the start menu. For the other Windows Live products and some of the optional components installed with Messenger, see my full blog entry on installing and uninstalling Windows Live 2009 QFE2 applications. Messenger may be considered a consumer product, but these forced upgrades are completely unnecessary and detrimental to Messenger’s user base. Ignoring earlier issues, beginning earlier this year Windows NT4 was blocked from using its [former] supported Messenger client, but Windows 95 continues to work (on the same version). Sure, Microsoft may or may not be able to officially “support” Messenger on these platforms, but blocking the clients only causes users to seek options like the above, or to just use other clients – which won’t have the Microsoft advertising that Messenger depends on. Posted on August 26, 2009, in Uncategorized. Bookmark the permalink. 7 Comments. it still doesn\’t work for the first option. So now… it doesn’t want to work anymore… i installed all the programs you said, ran compat program, my older v7 messenger opened, so uninstalled that, ran the compat program and the new v9 of messenger opens. BUT when i try to log in i still get the “forced upgrade notice” and if i say no, then it wont log me in. See screen cap for windows version and messenger open on desktop. HELP ( maybe an update to campat program is needed ?